Pours a clear dark brown with copper amber hues with a fairly rich off white head. Some spice on the nose but there is an unusual earthy aroma, not sure if that’s malt or dull spice. There may also be some malt sweetness and a slight hop scent but all the aromas are very subtle from this beer. ODD. It starts with a very light sweet taste on the tip of the tongue, then a nice effervescent carbonation and then you are hit with some very unusual flavors of spice, sweet, sour, citrusy, almost funky and not a good funk. It’s sour? I guess, it almost makes the back of your jaw shiver. Sorry if I lost you on the good funk, it’s a Belgian thing. Well it just gets worse as the beer warms up a little. It’s almost hard to swallow at this point. I misplaced my temperature probe so I’ll have to guesstamate about 64 or so degrees. This is just one odd tasting beer. I’m not sure what they were going for but it’s not working for me. Whew, the end of that glass was tough to get down. I don’t think I could say this is bad but I certainly do not like it and do not recommend it. Well that is unless of course you want to try a strange brew for Halloween. 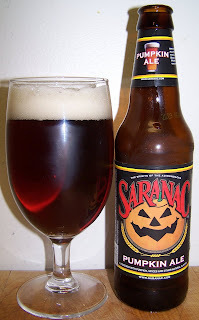 So another Pumpkin Ale goes down to the bottom of the list. I don’t know if I’m going to rate this or not. An F seems too harsh but I really did not like so maybe a D- but that seems to kind. Oh well I’ll just leave it at there, this is not a good beer.